In 2013, developer Don Huffines and state Sen. Ken Paxton backed the expansion of a taxing district in North Texas — a practice that isn’t uncommon, but that has exposed a fiscal rift among conservatives. After campaigning as Tea Party-backed champions of smaller government and fewer taxes, multimillionaire developer Don Huffines and state Sen. Ken Paxton, R-McKinney, are closer than ever to moving up the political ladder. Huffines defeated longtime Sen. John Carona of Dallas in the GOP primary and is all but assured a state Senate seat. And Paxton, who faces a May runoff with state Rep. Dan Branch, is the leading Republican contender for attorney general. But off the campaign trail, Huffines and Paxton haven’t always been so hostile to increasing the tax burden or empowering new layers of government. A year ago, the two backed the expansion of a taxing district in North Texas — a practice that isn’t uncommon, but that has exposed a fiscal rift among conservatives. 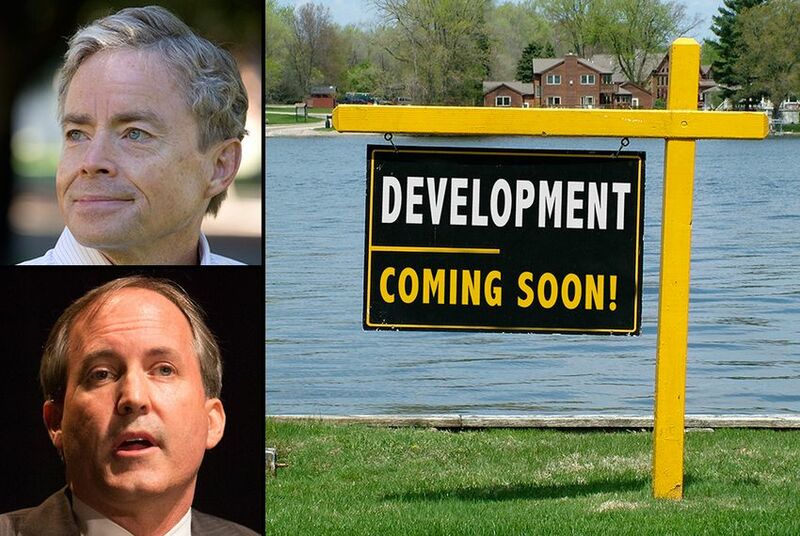 During the 2013 legislative session, Paxton sponsored fast-tracked legislation that let local residents vote on raising taxes to issue $63 million in road construction bonds — financing needed to help Huffines and his brother Phillip develop a 593-acre lakefront community called “Inspiration” in Collin County. That bill passed, as did the subsequent tax-hike vote within “Collin County Water Control and Improvement District No. 3,” in which a single person participated, according to county election records. Neither Paxton nor Huffines sees a conflict with their fiscally conservative ideology: Both say municipal utility districts (MUDs) and other local taxing entities give voters the ultimate say over whether to levy taxes on themselves. In an email, Huffines campaign manager Matthew Langston said the Collin County taxing district establishes “economic prosperity that is used to create family-friendly communities." Anthony Holm, a spokesman for Paxton, said support for Senate Bill 1852 was widespread in the county. “Last session, the House appointed a Special Purpose Districts Committee to vet these bills,” he said. "That committee included a number of Tea Party conservatives who advanced this bill out of committee before it passed the House 149-1 with the support of our opponent, Dan Branch." But critics on both the left and right have raised questions about how the taxing districts are established and the way tax-levying elections are conducted. They argue that the taxing districts help developers get rich at the expense of unsuspecting taxpayers, many of whom don’t live there yet. The taxing districts, which have sprouted up by the dozen in legislative sessions since the early 1990s, have also exposed a rift among conservatives — pitting those who argue they epitomize local control against those who say they conflict with Republicans’ anti-tax values. Gov. Rick Perry signed Paxton’s bill on June 14. Later that month, after the session-long blackout period on campaign contributions to state legislators ended, the Huffines brothers contributed a combined $15,000 to Paxton’s campaign. In November, when the tax increase for Collin County WCID No. 3 was on the ballot, a single voter granted it the authority to establish a tax rate of up to $1.20 per $100 in home valuation to finance road construction bonds for Inspiration. Elvio Bruni, senior vice president of Huffines Communities, said that voter moved into the district “toward the end of summer” and did not receive any incentives from Huffines Communities for living there. Stepherson, the attorney for Collin County WCID No. 3, said she expected the district’s total tax rate for services including water, sewer and roads would not exceed $1 per $100 valuation. Robert Bland, a professor in the department of public administration at the University of North Texas, said that rate was still "quite high." By comparison, the tax rate for all utility services in Dallas is about 70 cents per $100 home valuation, and about 60 cents in Denton, he said. While Carona attacked Huffines at least once for taxing districts during their bitter campaign — saying in a debate that Huffines was against all taxes “except for those taxes that you create” — it wasn’t a focal point for him. Carona himself had a history of voting for taxing districts and carrying such legislation. Fields, with the Texas Public Policy Foundation, said MUDs diminish risk on developers' investments by shifting costs the developer would normally shoulder to the homeowner.